One of the things I love is when you pick up a packet of something that is surely not vegan and miraculously, accidentally it is! (I'm looking at you, Arnott's BBQ Shapes and Nanna's Lite Apple Pies). For the good of all vegankind, or at least those who will be attending the Melbourne Queer Film Festival this year, in the comments I'd appreciate it if you'd tell me your favourite accidentally vegan lollies! I specify accidentally, because I don't think the budget will stretch to delicious lollies that are carried by Radical Grocery or are otherwise more costly than generic packets you get at your IGA. Sherbies are still vegan, I think. And those hard jubes from K-Mart. For all the food blogging I did while I was in Beijing, there are a few places I visited regularly that I never got around to blogging, for a variety of reasons. One of those places was a little Yunnanese restaurant close to where some of my friends lived, at which we quickly became regulars, often ordering the same dishes over and over again. It was my first real experience with Yunnanese food, and when I left China it was one I was worried I'd struggle to continue, given the lack of Yunnanese food in Melbourne. The only restaurant that Google spits out, other than the Neil-Perry Spice Temple, is Colourful Yunnan, on the corner of Grattan and Swanston in Carlton. So it was to here that me and my China adventure compatriots ventured on Friday night. There are so many amazing things on the menu here (take your meat eating friends). Wendy and I carefully selected some noodles, a delicious cabbage dish, and my long-time favourite, 土豆丝 (shredded potato). 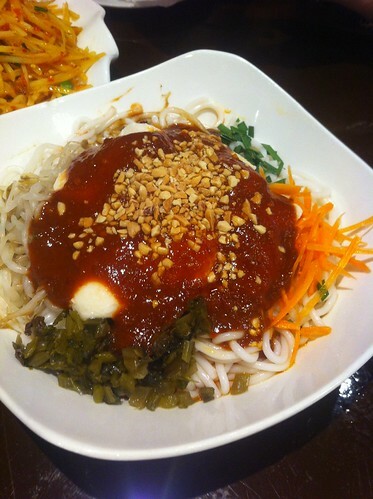 Yunnan food is spicy. Not as spicy as Sichuanese food, but it's getting up there, with lots of chilli all over the place. So I tried to order a mix of dishes, including some that would be less spicy for our less spicy friends, which means that we missed out on some of our favourites (cold black fungus - so good, but if anything the fact that it is chilled makes it more spicy. I know it sounds odd but trust me, if you like mushrooms and spicy food, order this. Or wait for my next review). 土豆丝 was fine. Nothing super special, a little too heavy on the chilli and the oil, but pleasant enough. Chinese cabbage I love at any time, and I especially love it sour and spicy (算拉白菜). So good, and this one was great, I haven't had it in a while and it was a delight to eat. These noodles! Wendy cleverly took a photo of the menu because the name was long, but foolishly I thought I'd remember it. I was wrong, and I will update this post when I am able with the name. However what I was not wrong about was the deliciousness. We had to order this vego specific, I think, and it comes with chilli, carrot, peanuts, mustard greens, beanshoots, hand pulled noodles and tofu, and you mix it all together and it's great. Service was prompt, even when we ordered more dishes halfway through the meal. This entire meal cost me $12. So cheap, so good, so happy. Will return, even if just for the noodles, which would make a meal for me and maybe even some takeaway. Get there on any tram that goes to Uni Melb. Totally inaccessible to wheelchairs. Very brightly lit, can order and pay at table. Outdoor seating. Menu is in English and Chinese characters, but is very word heavy and a little confusing. Cash only. 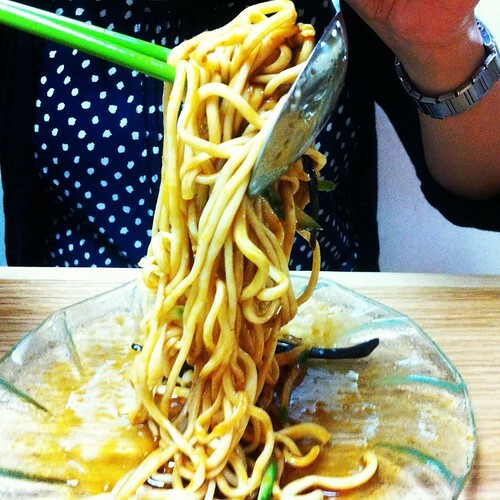 Hey remember that time I lived in China and ate the most amazing Chinese vegetarian food? Yeah, me too. I love Chinese Australian vego food, but there are definitely some distinct differences, so I was super excited to hear that Gong De Lin, one of China's oldest and most awesome vegetarian restaurants, had come to Melbourne. Wendy canvassed her veg family members who claimed it was part of the brand, not some copy cat, and we immediately scheduled a visit to check it out. Gong De Lin specialises in Shanghainese style food, and the menu is filled with all sorts of delicious goodies, lots of mushroom dishes and an awesome cold menu, which is definitely something I've been missing. If you've never tried the cold items on a mainland Chinese menu, I recommend it. Wendy and I were immediately drawn to the 上海冷面, which literally translates to Shanghai Cold Noodles, but I'm not sure if that's their English name. Anyway, they are some fun noodles to eat and I love them very much. They are hand pulled and freshly made. They are usually served with an array of sauces so you can mix up whatever your favourite combination is. 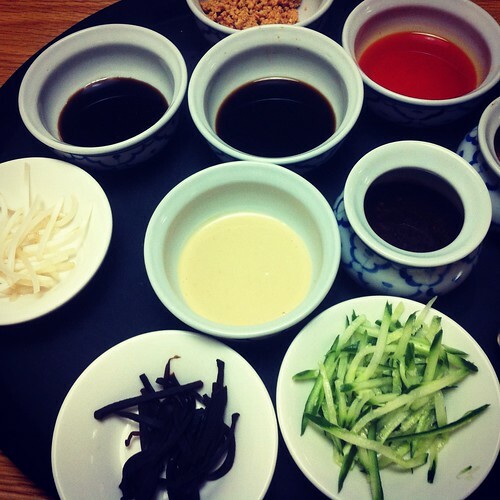 My favourite is soy sauce, sesame sauce, and chilli oil with a smattering of vinegar soy, which nearly brought Wendy and I to blows because she likes to use all of the vinegar soy. Although the noodles are on the menu as a two person serving, we decided to supplement by sampling the mapo doufu. This was a great if disorienting version of this dish, mostly because I'm so used to eating mapo doufu in non-veg restaurants, where I ask for it without meat, so to get it with the little meaty bits was freaky. But delicious. I enjoyed this dish, though it was a little sweeter than I'm used to, mostly because Shanghainese food is often a little sweeter than Sichuanese food. Gong De Lin is brand new in its Swanston Street position. The service was really delightful, with the waitstaff being very helpful letting us buy off menu (extra noodle portions) and very friendly. The menu is a little on the upper edge of a reasonable city lunch, at $38 for the two of us, with a little extra noodles each to take home for dinner. Gong De Lin is located on top of Noodle Kingdom, and I think they share a kitchen which comes up via a food elevator that buzzes when the food arrives. This was annoying but easy to get used to. And I'm going to get used to it. I definitely plan to return. As much as I love Enlightened Cuisine, I think this is probably my new favourite Chinese vego restaurant in Melbourne, and I'm very happy to have another choice when in the CBD. Get there on any train or just about any tram. Brightly lit, menus in English and Chinese. Access via an elevator, no stairs. Toilets are accessible. Ordering and paying can take place at the table, though they're fairly tightly packed. hope the nian was scared away and you got lots of oranges and noodles and good wishes and little sacks of gold (ie, dumplings). i had a dumpling party and failed to take any photos, except of me pulling faces with my decorations, but hayley brought tofu pancakes and catherine made saffron bread shaped like a snake, and everybody wore red and at 1am i called my mother whose reunion party (3 hours behind) was still going, and i had a lovely time. Tomorrow's LNY Eve, and two writers of my acquaintance are about to go to Beijing, and this time last year (this time lunar-wise, not gregorian) I was in Beijing wishing the fireworks would stop, and it means I've been thinking a lot about Beijing lately. So I thought I'd put together this list. There are so many of these lists floating around the internet, but how many of them were written by a queer, half-Chinese vegan Australian who fell in love with Beijing while working in an environmental organisation which was situated in the Emperor's Ancestral Temple next to the Forbidden City, and who got there by bike every day? None of them, that's how many. If you are severely, severely limited by time, take them in this order until you run out of time. You can hire a bike from just about any bike shop, and although the subway is cheap and extensive, if you're staying (and playing) within the 3rd ring road, bike is the way to see Beijing. Sure there's pollution and lots of cars, but I fell in love with Beijing from the saddle of my bike, weaving my way around the original city's walls and in and out of the hutongs. The bike lanes are huge, the city is flat and there is no wind, and there's a bike repair dude on every major intersection. Below I recommend places to eat, and Haidilao hotpot is on there. It's awesome, I love it as a food chain, and the food is the best of the chains I've been to. But for an experience, I recommend wandering down Ghost Street at night, and being sung into Little Sheep by the staff out the front wearing sashes after avoiding all the hawkers, having a man with noodles dance for you, and yelling across the restaurant. It's lots of fun. 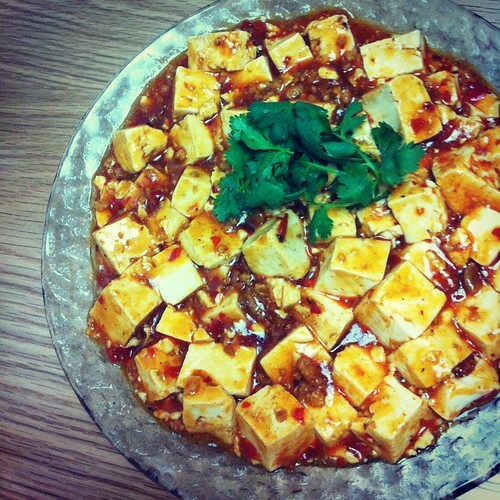 Order the tofu mix dish. You'll recognise Little Sheep by its flourescent ugly green lighting and signage. Dawn/early morning out at the Lakes Specifically Beihai, early in the morning when the sun is bright and clear and the oldies are doing their competing Taichi battles. It's musical and beautiful and hilarious and so China all at once. 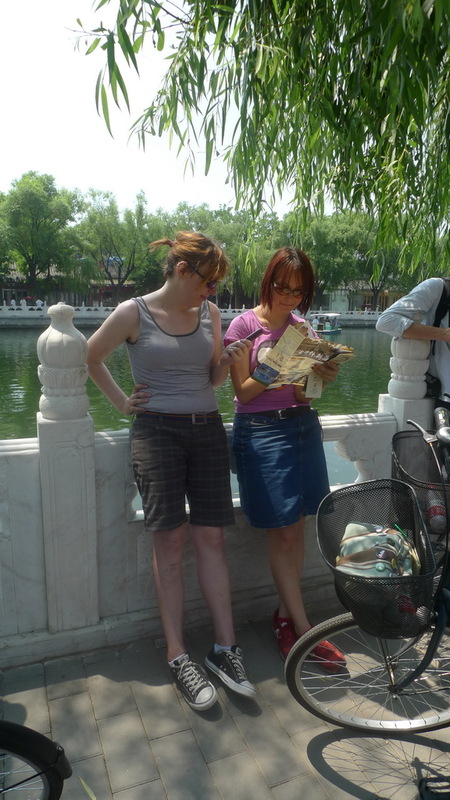 Take a biking tour You can and should guide yourself, but there's heaps of guided bike tours led by Beijing-ren who have lived in the hutongs their whole lives and know lots of random facts, and I really recommend it as a pleasant two hours to see the lakes district. I went with Chihaner, which is run by a friend of a friend, but I've heard good things about the ones run by the China Culture Centre (where I learnt to paint). If you have any interest in art, visit 798. 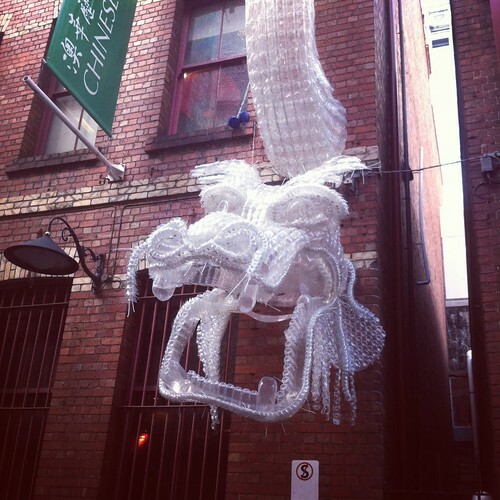 Located in an ex-warehouse district, it's filled with art of every kind by Chinese artists, tens of galleries and public art spaces and just a whole lot of awesomeness. When I was living in Beijing I visited at least once every two or three months. Definitely visit the Ullens Centre for Contemporary Art . The Hutong Kitchen is an awesome cooking and cultural school in an old Courtyard House, run by an Australian. They're super accommodating of my vegan requirements, and also sell the most delicious infused white teas. Email them in advance to book a place and let them know about dietary requirements. The Veggie Table is the only western vego restaurant in Beijing. It's got great couches, free wifi, and is next to the fixies and juggling store! 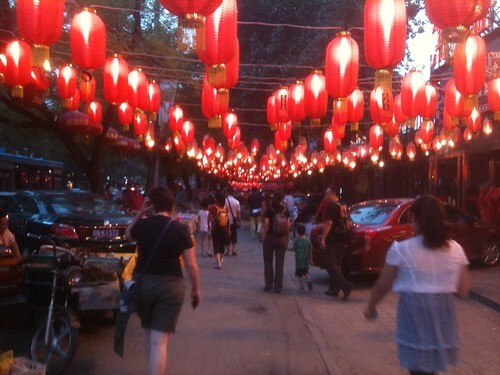 It's located in Wudaoying Hutong, which is a great place to visit. This is the only big famous thing I'm recommending. The Forbidden City is fine but it's huge and crowded and tiring and you'll have time for it later. The Summer Palace is pretty (go if you have time, for sure), and Tiananmen is iconic, but the Great Wall is the Number One Must See of these big historic locations. It would also be higher on the list except that it takes up basically a whole day, so can be difficult for someone on a tight schedule. Please note however that not all parts of 长城 are made equal - don't go to Badaling, go to Mutianyu or Jinshaling sections. And take the go cart down the wall. Haidilao, various locations around Beijing. Haidilao is a hotpot chain across Beijing. It's delicious and fun. It's not a vegetarian restaurant but several of the stock soups are, and everything comes out separately so it's all good. Sunao, Dongsishitiao, Dongcheng. Fancy-pants vegan Chinese tea house. If you go at lunchtime either read Chinese or bring a friend who does, but dinner has a colour, multilingual menu. Eat the fish. It's delicious. The Veggie Table, Yonghegong, Dongcheng. Vegan western food. The chocolate cake is so good, and it's the only place I was able to get a vegan pizza in Beijing. Wangfujing Bookstore, heaps of books, including a floor in English; a great array of learning books (ie, books that are in characters with pinyin subtitles); and lots of fun tourist maps and the greatest of postcards. Xidan Bookstore. Overwhelming but comprehensive. No English. The Bookworm. Expensive but fun. Mostly in English. For a subscription fee you can become a member and borrow books. Just try to return them (unlike my friend J).